We have a growing chorus of professionals making note of the expensiveness of the market and the high probability of a significant drawdown. Earlier in the week, Bloomberg ran an article titled “What to Worry About in This Surreal Bull Market”. The article quotes a number of respected professionals whose worries range from cyberattack to a plain old recession. Why is the market expensive? What makes 9/30/2014 significant? We just passed the 9/30/2014 operating earnings per share number. In other words, operating earnings have only increased by $1.41 per share. 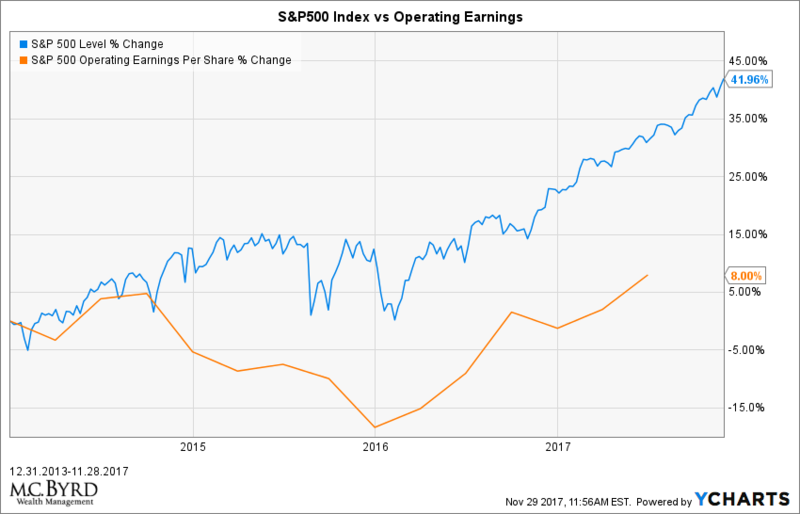 As you can see operating earnings have only increased by 8 percent while the market has increased by 42 percent, meaning the market has become more expensive over this time period. For the market to become less expensive, earnings will have to increase substantially or the price of the market will have to fall back in line with earnings. These are the only two choices. We believe that continued caution is the best strategy at this time.